A toddler reminds Arabelle of her first encounter with a deer. So Arabelle does something amazing. Several busloads of tourists were stretching their legs around the parking lot in a piney forest. They were anticipating a Forest Ranger presentation about the local wildlife. A toddler wandered about. Her mom was in the group somewhere, unaware that her little girl had a full diaper. But the girl didn't care about her diaper. 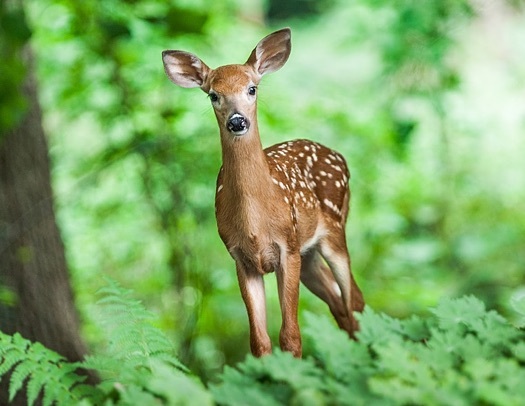 What interested her was the fawn standing at the edge of the forest bordering the parking lot. Arabelle had been watching the child. The child reminded her of when she kissed a fawn. Before she became Arabelle. Arabelle assumed the shape of a fawn and made herself visible. The little girl toddled over, making noises Arabelle understood to be the child's language. She reached over and touched Arabelle. Arabelle put her fawnish nose on the child's cheek in a kiss. Maybe it tickled, because the toddler laughed. Then she grabbed Arabelle's fur and held on. Some saw the child with the fawn. "Oh, look!" rang out in different voices. The tourists spread out facing the two. Snapshots were taken. And movies. None were immediately aware of the fact that no snapshot or movie captured any glimmer or shadow of the fawn. The child, yes, with arm extended as if holding onto something, but no fawn. Arabelle took a small step forward. The child followed, still holding on. Then another step. Soon, Arabelle and the toddler were several fawn lengths onto the parking lot. "Susie! What are you doing!" The toddler's mom hurried toward the pair. Arabelle slowly bent her front legs until the child was sitting on the pavement. Then bounded into the forest. The spirit that was Arabelle watched the mother hug her child. Then, sniffing, "Oh, you need your diaper changed, my precious!" Use this form to send a private note to Will Bontrager, the author of Toddling Child.